Forget smartphone charging. When it comes to next-generation wireless power, engineers in Japan are working on a system that can send large amounts of electrical power over considerable distances. Behind several prototypes and projects is a common idea: the ability to send power from the sky to the ground. The eventual goal of the research is a huge space-based solar array that isn't affected by earth's weather systems and constantly collects large amounts of energy, which is then sent down to receivers on earth via microwave. By that goal, today's prototypes are much more modest but still easily outgun the sort of wireless charging systems that you can buy for smartphones and other gadgets. 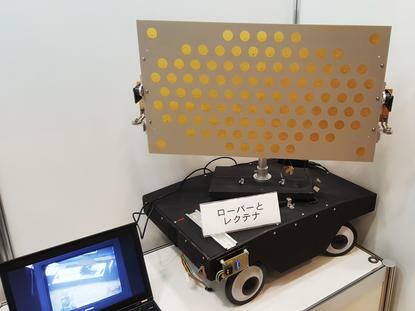 At this week's Ceatec electronics show near Tokyo, J Space Systems was showing off some of the antennas it uses to receive the high-power microwave transmissions. 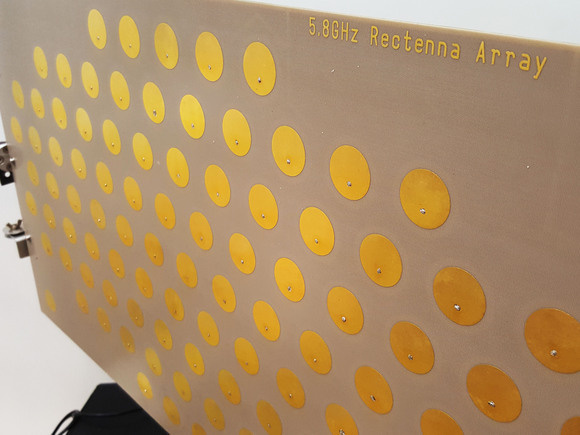 Called "rectenna," they are flat antenna tuned to the 5.8GHz frequency used in the tests. A rectenna, wireless power reception antenna, produced by J Space Systems is shown at Ceatec in Japan on Oct. 4, 2016. J Space Systems has successfully managed to transmit power over a distance of about 50 meters using the system, although with considerable losses. It pumped 1.8 kilowatts into an antenna that measured 1.2 meters square and managed to harvest 340 watts out from a receiver antenna that was 2.6 meters by 2.3 meters. Mitsubishi Heavy Industries is also pursuing similar research and last year managed to send 10kW of power over a distance of 500 meters, a new record for Japanese researchers at the time. To do this, it used large transmitting and receiving arrays. 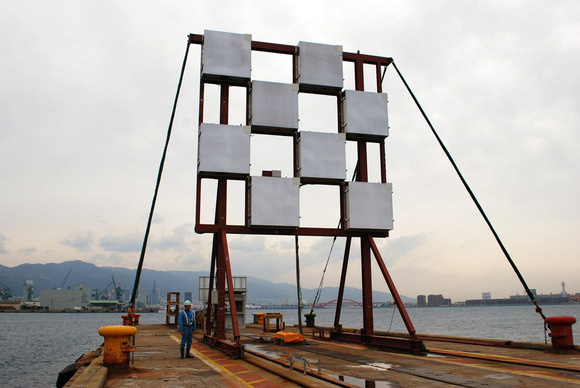 A wireless power transmitting array developed by Mitsubishi Heavy Industries and used in a test in Japan in 2015. Should the technology continue to progress, there are several envisaged uses. One is using it at short range to send power around factories, enabling machines, sensors, and workstations to be easily reconfigured without having to run new power cables. Another potential application sees balloons being used to send power down to areas hit by natural disasters where electric power is out, while the technology could also be used to send power up from the ground to a drone or similar object to keep it in the air. But all of those are small projects compared to the futuristic idea of orbiting solar arrays, capable of collecting large amounts of the sun's energy and sending it down to earth. 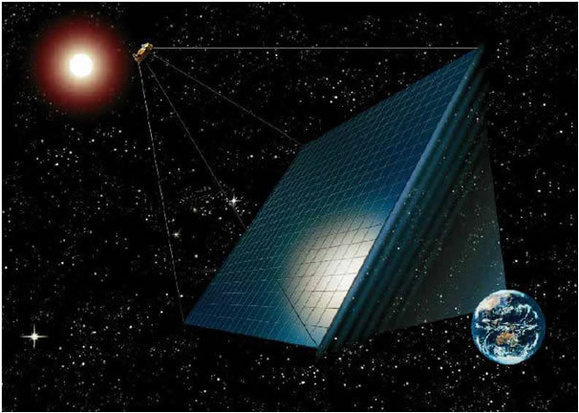 An artist's concept of a future solar space array. To get to that stage, there's a lot of development work to be done, including the major task of reducing transmission losses. Japan's space agency, which is pursuing the idea, admits that the idea of harvesting solar energy in space isn't new. Previous projects in other countries have been closed due to lack of political support for such a system. Nevertheless, the space agency is continuing to push researchers on the technology. But it remains realistic. "It will take significant time and effort to overcome the many hurdles on the pathway to the realization of the solar space power system," it said.